My Flight Blog: Mission Accomplished - Private Pilot ASEL Earned! Mission Accomplished - Private Pilot ASEL Earned! Ninety-five days ago, I set out to make a dream become a reality - to earn my private pilots license. Today, I passed my oral exam and private pilot check ride and earned my Private Pilot - Airplane Single Engine Land license. I will write a more detailed post in the coming hours or days about the specifics of my oral exam and flight test. I really appreciated the detailed accounts that other pilots posted on the StudentPilot.com message boards. My exam took a little over two hours, evenly split between flight time and the oral exam, and was an enjoyable process. As I touched down on runway 6 the instructor said "all that is left is for me to fill out some forms, congratulations". I knew I had a great flight but hearing him say that was awesome. Even better was that my wife was waiting at the airport willing and ready to be the first passenger despite some fears of flying in a small plane. After the paperwork was completed, I thanked the examiner and my instructor and went off to exercise some of my new privileges. My wife and I fueled up and took off for a brief sight seeing tour. 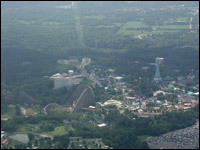 We flew north and circled King's Island amusement park when she took a photograph or two. We decided to make this a nice short flight to get her acclimated to the small plane experience. But I was proud of her as she was very confident flying with me really seemed to enjoy it. 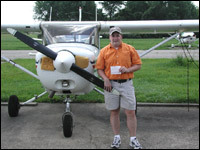 My goal of earning my private pilots license is complete but my flying adventures have just begun. I will continue to post about my flying experience on this blog on a regular basis. Additionally, if at some point I decided to get my instrument rating I will track those experiences as well. Congrats!! ..and thanks for setting up this blog, and taking the time to share your experience. You've inspired me! Congratulations Todd -- with your dedication and hard work it's no surprise that you passed! Great job, and I'll look forward to reading of your future flights. Awesome job on the pilots license, and also on the great writing, links, and insights into the process. It has truly been a pleasure reading each and everyone of your posts. I can't wait to read more of your future flight adventures. Congratulations Todd! This is such an exciting achievement. It is a testament to your flying abilities that Cynthia flew with you - and enjoyed it!